Students will plot ordered pairs on a coordinate plane (quadrant 1 only) to represent their battleships. They will guess ordered pairs to try to sink their opponent's battleships while practicing coordinate graphing skills. A great way to keep your students engaged! The game Battleship set on a coordinate plane. Students practice their ordered pairs while attempting to sink their opponents ships. I recommend copying the 2 page document double-sided and laminating it. Then the students can use dry-erase markers and you can reuse the gameboards over and over. Allow your students to explore the coordinate plane while playing battleship! All you have to do is give them the handout and allow them to play. They love practicing coordinate points after I show them this game! Negative and Positive Coordinate Plane Battleship game for students. Perfect for centers or a review. I glued the board inside file folders and had them laminated, so we can use them over and over again! My sixth graders love it! Students will have fun with this interactive practice of coordinate grids. This game allows students to practice plotting different coordinate points along "map" using the 1st quadrant.Easy to assemble, and all you will need is dry erase markers :) (No game pieces needed) Enjoy! 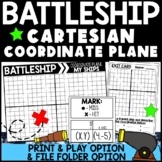 Negative and Positive Coordinate Plane Battleship game for kids. Perfect for centers or review. Students put a shield/barrier between themselves and call out ordered pairs to guess where each others ships are. My fifth graders LOVE IT! 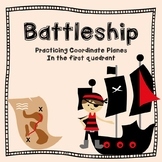 Your students will love this Coordinate Plane Battleship Game! It's just like the Battleship board game, except your students will need to call off points by their ordered pairs. It's great practice for plotting points in all 4 quadrants of the coordinate plane. Enjoy! This game will give students practice finding ordered pairs on the coordinate plane while playing a game the classic game of Battleship. This product is common core aligned. This is a great game to leave with a substitute when you have to be out and don't have time to type up instructions! It deals with coordinates in all four quadrants or you can do just one quadrant for younger grades. This is a partner game to help students learn how to graph and interpret coordinates on a coordinate plane. Students get to practice graphing ordered pairs in quadrant 1 of a coordinate plane. This is a great center game. This game of battleship will allow students to practice finding coordinates on a given plane in a fun and entertaining way. Students place their "ships" on the cartesian coordinate plane. Guideline for ships are on the worksheet. Students will work in pairs to guess the location of each other's ships. I usually give each student a manilla folder to hide their papers from their opponent. Need a fun activity to enhance learning of how to graph points on a Coordinate Plane? Engage your class with this fun game that all students can enjoy! This activity is a great way to introduce the coordinate plane - kids will never be confused again! It's also lots more fun! Use it as practice after introducing, as a workshop, station, math center, or task. Great for new content, review, test prep, or fun! Activity for practicing plotting points on a graph and reading points from a graph. Should be used as in-class practice in pairs. This is a fun way to review ordered pairs in all 4 quadrants. Can be done whole group or in pairs. Worksheet included for students to keep track of their guesses.